Since we were a little shy of cake in the Dingle shop, I went baking. Nothing fancy, just some yummy chocolate chip cookies. 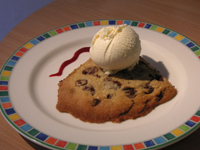 I like my cookies dense not fluffy, and these make a perfect combination with vanilla ice cream, if you want to try them. 2. Combine sugar, and brown sugar and melted butter and beat until light. 4. Slowly add flour, mixing all the time. 6. Stir in chocolate morsels. 7. Spoon onto a lightly buttered baking tray. 9. Remove tray, rap on counter. 10. Bake another 4 minutes. 11. Transfer to wire racks to cool. As always, good chocolate and vanilla will make all the difference in how these taste. 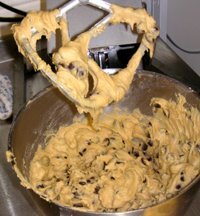 The photo with the mixer is a triple recipe, so don’t worry if your mixer doesn’t look that full! I have 25 cookbooks. I assumed that somewhere amongst the lot of them, there would be a recipe for chocolate chip cookies. I mean, I have a cookbook dedicated to chocolate. I was wrong. There wasn’t. This looks like it is exactly what I was looking for. I made them. They turned out wonderfully and went down very well with the first taster. 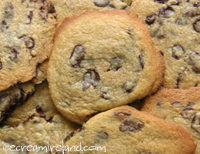 They’re the nicest chocolate chip cookies I’ve tasted, and I’m not saying that just because I made them. I am delighted. I just served up another batch to the shop, and I must say I ate a few myself! I’ve made them Saturday and last night – absolutely gorgeous. Both times I ate quite a lot of the dough before I cooked them – I couldn’t help myself, it was so good! Thanks a mill for the recipe Keiran! That seems delicious, but I have been searching far and wind in Dublin for chocolate chips but i can’t find any. Where did you find the chocolate chips ? I’m so pleased with this recipe; it’s absolutely yummy. I made one batch of it this past weekend and it turned out fantastic. It was my first attempt and it was a success. So, now I feel more confident to make tons of it for Christmas for my family and friends. I have only one question… Is it possible to make tons of it in advanced and freeze the dough and use it as I need it? One more thing to say, I absolutely love your website, it’s genius and I go to you guys first before looking up for other recipes. I can almost smell this already, unfortunately I don’t have the ingredients at home right now, else I would’ve prepared one (or two ;)) right now. I bookmarked this recipe ages ago intending to make it over Christmas as part of our homemade foods gifting. I’m very excited now that it’s very very very nearly baking season! One question: can you explain the instruction to “remove tray, rap on counter”? I’m going to do exactly as told, I was just curious. Sabrina – let me know how you get on. I take it out of the oven, with oven mitts, and give the tray a bang on the counter to make sure the cookies don’t rise too much and keep nice and dense. Then I put the tray back in the oven. The rap on the counter settles them down. 😉 Does that make sense? Made this recipe in my tiny convection oven – worked quite well, considering. The cookies were great, thanks for the recipe!